Disclaimer: Khuyen Bui is a columnist for The Tufts Daily. He was not involved in the writing of this article. Wanting to give members of the Tufts community a space to do and share what they love with others, several students came up with the idea for Tufts Open Call, a new community on campus, last spring. As the name suggests, Open Call provides a space for anyone affiliated with Tufts to build connections with each other over different activities each week. “Open Call is a manifestation of my hope to create [a community] for people to come together and do things that are meaningful and that they enjoy,” senior Khuyen Bui, a founding member of the group, said. Open Call, which hosted its first event in November of 2016, gathers weekly on alternating Wednesday and Thursday nights in the Dowling Hall lounge at 8:45 p.m., according to Bui. The students who organize Open Call purposefully avoid a hierarchical leadership structure. There are no presidents or club leaders, and they describe it as a community rather than a club. Sophomore James Ray, who is actively involved in Open Call, said everyone is encouraged to get involved with planning weekly events. Bui said that he decided that the Dowling Hall lounge would be the ideal place to host Open Call events after having attended an art show there in April 2016. Aside from the aesthetics of Dowling, Bui also hopes to bring beauty and creativity to a building generally associated with admissions, career planning and paperwork, all of which tend to create a stressful environment. Before each meeting, Ray and others transform the Dowling Hall lounge by stringing around colorful lights, putting out food and pushing away the chairs. This is meant to create an atmosphere in which people feel comfortable and to set the scene for the events of the night. Afterwards, the group participates a in theme-related activity. Last semester, the broad theme was “anchoring.” This semester’s theme is “childhood sensations,” according to Wong. Each week, a specific aspect of the theme is explored. For example, a few weeks ago, the space was devoted to the sense of smell, according to Wong. Participants were paired up with strangers to get to know each other and then described them using scents. They also worked together to create a unique smell out of ordinary spices and other fragrances, Wong, who helped plan the activities for that week, said. Ray described an Open Call activity that he planned last semester in which everyone was blindfolded and then received a massage from someone else present. 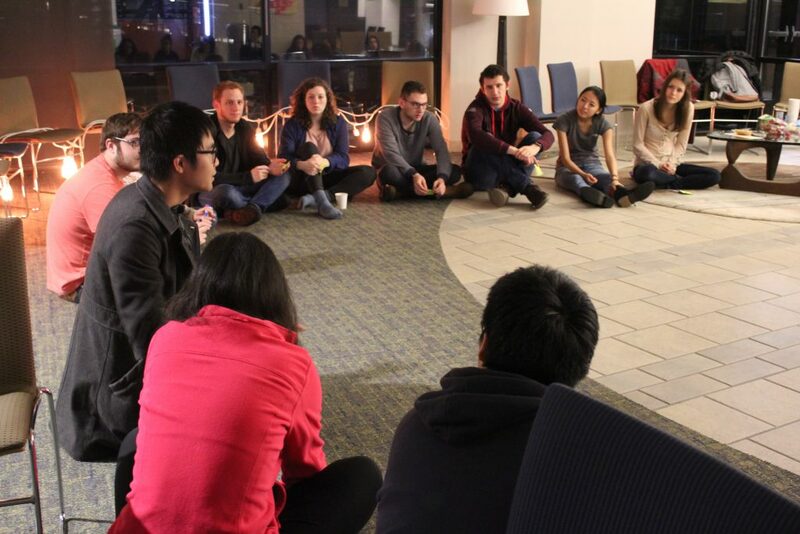 Each week, the activities end with closing circle to bring everyone back together for a final discussion. At the end of the gathering, people usually stay longer to talk to each other, building further on the bonds they had just made. “One of the nicest things I’ve heard, feedback wise, is that people tell me, ‘I’ve just made this friend at Open Call.’ People feel they have made new friends,” Ray said. All of those involved in Open Call have high hopes for its future. Already, the size of Open Call gatherings has grown to over 30 people each week, according to Wong. While there are many regulars, new people come each time. The Open Call community is not just limited to Tufts students. According to Bui, professors, graduate students and other Tufts affiliates have been involved. Bui hopes to eventually expand this further by getting children involved to bring even more perspectives. According to Bui, Open Call plays another important role in the Tufts community by creating a space for people to put aside their worries.